This reflection by Virginia Heffernan defies quick summary, but let me give it a try: Proponents and critics of new reading technologies alike defend their positions by appealing to Science, but usually in sloppy and superficial ways. Exposure to Michel Foucault and historians of science at a tender age left me with no doubt that the language and apparatus of science are regularly deployed in a power play.... Worse still, for those of us interested in phenomenology, the claims of neuroscience rarely enrich the human experience they set out to elucidate. In fact, they flatten it and make it unrecognizable. Those last words are from an eighteenth-century attack on novel-reading, and here Heffernan's argument seems to be that humanists who decry speed-reading apps like Spritz — responses to this app are the take-off point for Heffernan’s post — sound just like those people who decried novel-reading. And since we know that those earlier critics of their new media were wrong, it therefore follows necessarily that critics of today's new media are wrong. The logic there is not sound. Heffernan's chief point, then, as best I can discern it from what is frankly a confusing essay, is that people who criticize new reading technologies in the name of neuroscience are, "with mounting hysteria,” “flattening” our reading experience and snatching from us “the rapture of reading and the Internet” — a claim that I just can’t make any sense of. How does criticism of Spritz — well-founded or ill-founded — compromise my reading practices? And what has happened, by the end of this essay, to Heffernan’s earlier recognition that the makers of Spritz employ a very similar science-based rhetoric, just from the other end of the technological see-saw? “The Spritz inventors spoke of their product as if it were revealed religion. Spritz, the materials claim, ‘reimagines’ and ‘reinvents’ reading — no less than the defining act of history, the humanities and, some say, humanness itself.” Why has all the blame shifted to the critics? Especially dubious is the claim made by the company that a mere 20% of reading time is typically spent “processing content” as opposed to moving the eyes around the page. The company’s website provides no references for this claim, nor does it precisely explain what it means by “processing content.” Under a very generous interpretation of the claim, perhaps what is meant is that individual words can be recognized in a fraction of the time that people normally spend gazing at them in a sentence. For example, people show behavioral evidence of having recognized a word even if it’s presented subliminally at a rate faster than 50 milliseconds (though they’re not usually consciously aware of having recognized the word at this speed). This might give the impression that it’s the sluggishness of eye movements that creates a bottleneck for reading speed. But reading involves a great deal more than recognizing the individual words that are strung together in a sentence: readers have to integrate each word into a meaningful structure; build a mental model of the events it describes, and generate inferences about meaning that may not even be linguistically encoded. Some of these processes can take considerable time, and there’s some evidence that when readers slow down in order to generate richer inferences and more detailed mental representations, they may retain more information. It seems more than a stretch to assert that the time it takes to program eye movements is what limits the speed of reading. So it’s likely that some form of RSVP may well turn out to be a viable way to read through certain kinds of texts—in particular, texts with simpler sentences, sentences in which the complexity of information is evenly distributed, sentences that avoid unexpected twists or turns, and sentences which explicitly lay out their intended meanings, without requiring readers to mentally fill in the blanks through inference. 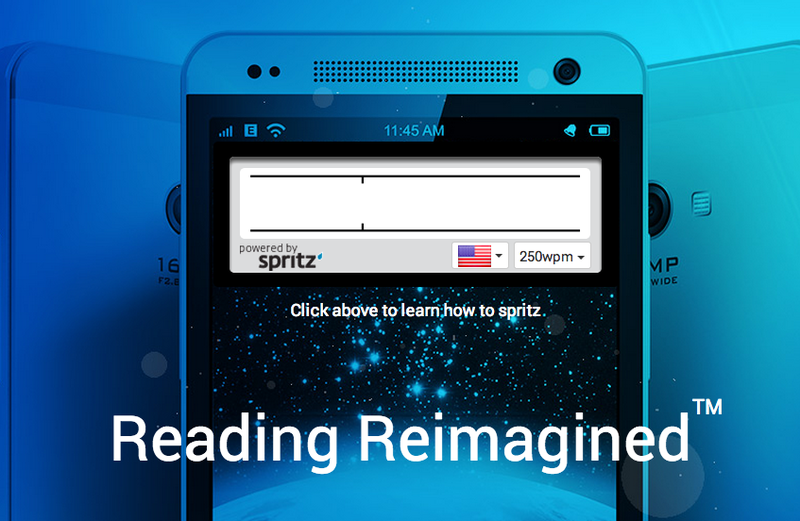 But a Spritz-style app is unlikely to provide a satisfying method for reading texts that involve complex or unfamiliar ideas, that require deep processing, or that use language in innovative ways. Some might argue that this app is especially unsuitable for many of the texts that are actually worth reading. We are free readers. And for us, the attempt to read non-instrumental texts in an instrumental way — to read fiction or poetry or history or theology or even what the bookstores call “current events” as quickly as possible and with the goal of accurate transference of data — is not a good idea. It is in fact a perfect recipe for boredom, because, though few people realize it, many books become more boring the faster you read them. This really shouldn't be surprising. Especially if a book is artfully written — if its language is unusually vivid or lovely, or if its presentation of ideas or images is subtle and surprising — its best features may be easily passed over by the rapid reader. And this is true not just of fiction or poetry or drama, but of many works of nonfiction as well. Careful writers of narrative, whether that narrative is fictional or historical or journalistic, will, like composers, work with themes and variations on those themes. So don’t be afraid to slow down, is all I’m saying. I find your observations to be true, especially when reading the Bible. I have tried to stick to a certain pace of chapters per day, but seem to be unable to stay above one or two. Considering that I keep a journal and try to "make sense" of what I'm reading, I think this is fine - even helpful. If one sentence contains decades, centuries, millennia, etc. (epochs? ), reading slowly and with a mind to understand is absolutely essential.